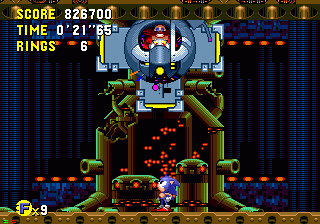 SegaCD Sonic the Hedgehog CD (JPN/USA) in 18:04.75 by nitsuja & Upthorn. Sonic the Hedgehog CD was developed to showcase a new Genesis/Mega Drive peripheral, the Sega CD. Likewise, this movie is the first of its kind on TASVideos and showcases the newly updated Gens emulator that allows for making stable movies of Sega CD games. However, upthorn and nitsuja ignore this entirely and tear through the game in standard Sonic TAS style, skipping many portions of the levels with unintended shortcuts and leaving the camera to try to catch up. There are two AVIs, the first recorded with the US music and the second with the Japanese music.